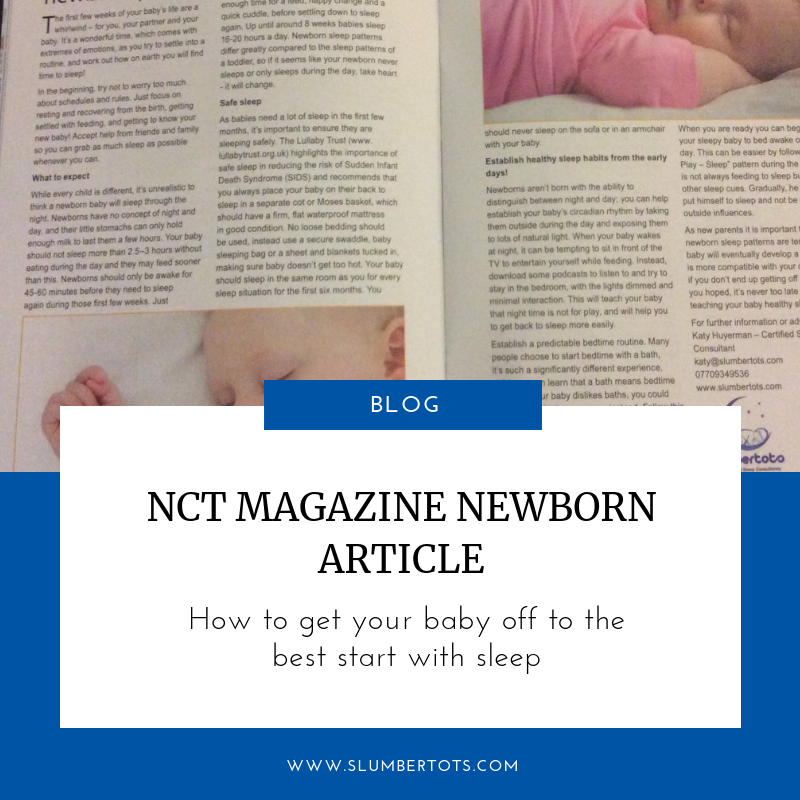 I was delighted to write this article on newborn sleep for the NCT magazine. The first few weeks of your baby’s life are a whirlwind – for you, your partner and your baby. It’s a wonderful time, which comes with extremes of emotions. In the beginning, try not to worry too much about schedules and rules. Just focus on resting and recovering from the birth, getting settled with feeding, and getting to know your new baby! Accept help from friends and family so you can grab as much sleep as possible whenever you can. While every child is different, it’s unrealistic to think a newborn baby will sleep through the night. Newborns have no concept of night and day. And their little stomachs can only hold enough milk to last them a few hours. Newborn sleep patterns mean that your baby should not sleep more than 2.5–3 hours without eating during the day and they may feed sooner than this. Newborns should only be awake for 45-60 minutes before they need to sleep again during those first few weeks. Just enough time for a feed, nappy change and a quick cuddle, before settling down to sleep again. Up until around 8 weeks babies sleep 16-20 hours a day. Newborn sleep patterns differ greatly compared to the sleep patterns of a toddler, so if it seems like your newborn never sleeps or only sleeps during the day, take heart – it will change. As babies need a lot of sleep in the first few months, it’s important to ensure they are sleeping safely. The Lullaby Trust (www.lullabytrust.org.uk) highlights the importance of safe sleep in reducing the risk of Sudden Infant Death Syndrome (SIDS). The Trust recommends that you always place your baby on their back to sleep in a separate cot or Moses basket, with a firm, flat waterproof mattress in good condition. No loose bedding should be used. Instead use a secure swaddle, baby sleeping bag or a sheet and blankets tucked in, making sure baby doesn’t get too hot. Your baby should sleep in the same room as you for every sleep situation for the first six months. You should never sleep on the sofa or in an armchair with your baby. Establish healthy sleep habits from the early days! Newborns aren’t born with the ability to distinguish between night and day. You can help establish your baby’s circadian rhythm by taking them outside during the day and exposing them to lots of natural light. When your baby wakes at night, it can be tempting to sit in front of the TV to entertain yourself while feeding. Instead, download some podcasts to listen to and try to stay in the bedroom, with the lights dimmed and minimal interaction. This will teach your baby that night time is not for play, and will help you to get back to sleep more easily. Many people choose to start bedtime with a bath. It’s such a significantly different experience, children soon learn that a bath means bedtime is near. If your baby dislikes baths, you could give him a relaxing massage instead. Follow this with a feed and a story or song, before placing him into his Moses basket or cot awake. Try to keep the routine the same every night and around 30 minutes long. A consistent routine will allow your baby to anticipate what is about to happen next. When you are ready you can begin to try putting your sleepy baby to bed awake once or twice a day. This can be easier by following an “Eat – Play – Sleep” pattern during the day. This means he is not always feeding to sleep but rather learns other sleep cues. Gradually, he will learn to put himself to sleep and not be dependent on outside influences. As new parents it is important to remember that newborn sleep patterns are temporary. Your baby will eventually develop a sleep pattern that is more compatible with your own. Remember, if you don’t get off to the start that you hoped, it’s never too late to teach your baby independent sleep habits. If you’d like to have a chat to get some more advice and guidance, please get in touch.